Courtesy Kiki Smith Studio, 2011. Leonard Schwartz: Today’s guest, on the phone from New York, is Kiki Smith. She is an internationally known artist working in multiple mediums. About her work, it has been written, “Smith represents the female body as one of resistance and transgression. Her women reject the graceful refined poses of Western statuary, and startle by performing extremely private acts in a remarkably public and matter of fact manner.” The work of Kiki Smith’s I’d like to talk about today is a collaboration she’s done with the poet Leslie Scalapino: The Animal Is in the World Like Water in Water, published by Granary Books in an edition of forty or forty-five copies. We have one copy here at the Evergreen State College in our rare books room. Welcome, Kiki Smith. Kiki Smith: Thank you. Thank you very much. Schwartz: Wonderful to have you on the line. I know you’re a busy person and working on many projects all at once. 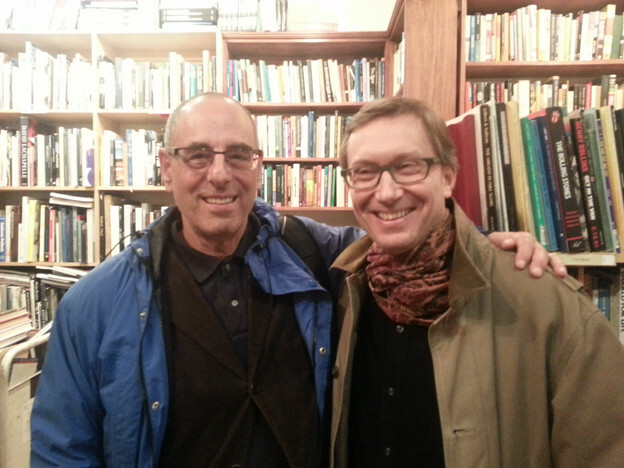 Can you say a little bit about your collaboration with the poet Leslie Scalapino? Smith: Sure. Leslie had asked me to write her — I don’t know what you call those — a blurb? Smith: For the back of a book that she made, also with Granary Press, and I did. At that time, I didn’t know she was friends with my friend Mei-mei Berssenbrugge, and I didn’t know her work particularly well, although I had heard her read. I’m not somebody who writes blurbs. I don’t know much about things like that, but I did it nonetheless. Then thinking about it, I wrote that I really liked her work. I think she suggested to me then that we could make something together. I didn’t have any idea particularly what to do. I made some very strange drawings, and then I thought she could make something that went with them. We tried to think of who could publish it, and that took a while. We asked Granary, and they weren’t interested in doing it at the time because they had other commitments. So, we didn’t really know where to go with it, but we sort of made it nonetheless. Leslie also rewrote and reworked it, and then eventually Granary Press came back to me, just by chance, and asked if we would like to do it. They were ready, I guess. We said, “Yes, we would love to,” and then we started working on it. Schwartz: There was a period in the past — I associate it with the heyday of the New York School — in which poets and painters worked together collaboratively in really exciting ways more often. That’s rarer these days, and you are an artist who has worked with poets. You mentioned Mei-mei Berssenbrugge and now Leslie Scalapino. Let me first just say, the book is extraordinary. It includes digital prints of your images, each individually hand-colored by you, Kiki Smith. The book is accordion-bound in Ultrasuede, a pleasure to the touch. There are forty-five copies. Each one of those copies is very expensive. It’s very much an art object or a book art project, as well, to which one makes pilgrimage in order to find a copy and read the book, or to read the book and look at the book. Can you say, though, a little bit about the relationship between word and image for you in this book? Smith: I periodically like to use words in relationship to my work. Probably because, historically, how language and image go together is very interesting. It has a rich history pre-book: in painting, and then in stone. Like the Sumerians or the Egyptians, where it’s pictorial and language at the same time, or like altar paintings of the saints with words coming out of their mouths, or Nancy Spiro’s work. She’s worked very extensively with text. Before that, when I was younger, I mostly worked with my own text. Since I met Mei-mei Berssenbrugge, we’ve made maybe four projects together. And I’ve worked with Leslie and Anne Waldman a little bit, and different people. Henri Cole and I made a broadside together. For me, it’s just a pleasure. I’ve also made several books with Lynne Tillman, who’s more a fiction writer. But it’s interesting because it can’t be illustration. You can’t make something that is an illustration of something, because then it’s just working for somebody else, which I’m not that into. Each one that I’ve done, for the most part, has really been a collaboration, and sometimes it comes just from talking. Mei-mei and I just talked for a long time, and then we did things simultaneous to one another. With Leslie, I actually made the work first, you know, in a certain way. She wasn’t making an illustration either; she made something that could couple it, that could coincide in the same space. In certain ways they go together, and in other ways they move apart from one another, or are antithetical to one another’s meaning. I like that it’s not a one-to-one correlation. It’s just possibility. Smith: Which also has a great history. You know, it has to work, even if very superficially. Mei-mei will make poems and I just use all the animals she mentions in the poems, or all the different kinds of natural phenomenon. I’ll just make images of those. In that way it’s maybe closer [to illustration], but it’s just whatever is pleasurable, and also — in terms of printmaking or technically working with paper masters or master printmakers — what’s interesting. How to push that: your use of and the form of a book. Schwartz: You do mention that your sequence of forty-three drawings had been, I think, completed beforehand, and it’s titled Women Being Eaten by Animals. About those drawings, Scalapino writes, “I wrote the poem using the sense of an unalterable past occurrence: One female, apparently the same girl, is repeatedly, in very similar images as variations, bitten and clawed by a leopard-like, lion-like animal. Both person and animal have abstracted features, giving the impression of innocence or opaqueness. As in a dream of similar actions or a dream of a single, timeless action, the girl flecked with blood while being unaltered by the animal’s touch, there is no representation of motion except stillness of the figures floating in space of page. Neither the girl nor the animal articulate expression, as if phenomena of feeling(s) do not exist.” Kiki, we are on radio and we can’t show the images, so I’ve read this text on your images. Is there anything you can say about the extraordinarily sensual and extraordinarily disturbing quality of the woman being eaten by animals? Smith: I was asked by the Museum of Modern Art, by Wendy Whiteman, if I wanted to make an exhibition of my prints, probably a little less than ten years ago. I wanted a hook for it because it was Queens. She asked me if I wanted to make a billboard, which never happened, but I immediately thought of Rousseau’s — I think it’s a lion or leopard attacking the white antelope [Henri Rousseau’s The Hungry Lion Throws Itself on the Antelope] — and it has the same trajectory of those animals. There is a central animal and they are in some big jungle, and then the other one comes lunging into it. So, I thought about that: that most animals are actually eaten. They leave the planet being eaten alive. I had to think about that for a while, unpleasantly. But then I also thought that, for me, it was more how you get out of your body. How you get out of your own ego-consciousness. What penetrates and what is penetrant to you, and what gives you freedom at the same time? I think about animals a lot in very convoluted ways, but part of it is this sort of shamanistic space of people either acting as animals, or making associative attributes to animals, or anthropomorphizing animals. It moves around. But it’s just my own convoluted entertainment of how to escape “me,” or something like that. It’s not unpleasant any of it. It’s also [this idea that we are] not to be separate from the rest of the universe, that we have this idea of autonomy, but really we’re a part of a whole. Schwartz: I certainly was moved by that aspect of the work: the absence of privileging the human over the animal, that there is a kind of offering being made. I also thought of certain images from early Buddhist tradition — I think it may be Indian Buddhism, but it may be elsewhere as well — that illustrate the story of the Buddha offering himself to the starving tiger to be eaten. I know your work tends to get associated with a certain kind of relationship to Catholic spirituality, but I kept thinking of that image of the Buddha’s offering of himself to the tiger. Smith: That’s interesting. My mother was a Catholic. She converted to Catholicism from some other religion, but then she converted to, or rather, practiced Hinduism and Buddhism. So, I think it’s true to say that I grew up in a mixed household. And anyone, from the sixties anyway, is influenced by Hinduism and Buddhism and many other religions just by the nature of growing up in the sixties, which I did. Because, you know, the East … For the last hundred years in art and in philosophy, but very directly in art, Hinduism and different parts of Buddhism, certainly Zen Buddhism, were a very big influence. I’m very interested in the iconography of religions, much more than I’m actually interested in belief systems. I feel like being Catholic was enough for me for one lifetime. But I love the iconographies that are associated with belief systems. I find that one can be playful in those histories also. Schwartz: Absolutely. I just spoke with Ibrahim Muhawi — who is a translator of Mahmoud Darwish, the Palestinian poet — about the difference between metaphor and symbol. Symbol has to do with identification, he argued, in locking us into a body, or locking us into a particular tradition; whereas metaphor opens things up, retains a relationship to a thing to be sure, but also opens it up to multiple possibilities. Also, of course, Leslie Scalapino as a poet is very influenced by Zen Buddhism as a practicing Buddhist. Smith: She was a really fascinating person, someone who was very abstract in her thinking. But I think the thing that I liked about — more when you listen to her, if you let it go inside of you — I always thought it was a little like standing behind thought. Like you’re standing behind thought, just observing it. And it goes into you, in a way that you don’t have to be analytic. You can, but you don’t have to [in order] to get it. The words penetrate you and then make a consciousness inside of you. I mean, she has an enormous breadth of work. She had dynamic energy for her work and for many other artists’ work, and supported other artists: artists and writers both. Schwartz: Sure, theater as well. I think dance groups have been involved as well. Smith: Yes, dance. I recently saw her piece with Fiona Templeton. Schwartz: Kiki, can I read a short passage from the poem? Schwartz: This is from Kiki Smith and Leslie Scalapino’s The Animal Is in the World Like Water in Water. So, that was Leslie Scalapino from her collaboration with Kiki Smith, The Animal Is in the World Like Water in Water, published by Granary Books. That last line I stopped at, “hierarchy is incomprehensible,” also really speaks, to me, to the relationship between the two forms: your drawing of the female form and the animal form. Kiki, can I ask you, do you have other specifically poetry and art collaborations that you are working on currently? Smith: Uh … I don’t know. I can’t remember! [Laughter.] I’m trying to make stained glass windows with songs, with words from songs. It’s something I’ve wanted to make for about ten years, so I finally decided to make it now. It’s with a song called “Tramp on the Street,” which was written in the late 1800s. I’m always, in my fantasy life, making chapels, which I make and don’t belong anywhere. No one seems to have the slightest interest in them, but I need to make them. I feel very passionate about making them, so I’m going off to Germany for the next month to paint some more. And besides that, I don’t know. The only thing I did want to say is that “the animal is in the world like water in water” is from George Bataille, and I think it’s from Theory of Religion. I’m trying to plod my way through reading that, which is not easy. Schwartz: Thank you for mentioning that because I did note that “the animal is in the world like water in water” is a quote from Bataille. And I did think about the collaborations between George Bataille and Hans Bellmer, their edition of The Story of the Eye. Schwartz: Do you know Bellmer’s poupées, those dolls, those infinitely flexible female forms with a certain kind of violence towards the form built into them? Do you have a view or interest in Bellmer? Smith: When I was young I hated them. I thought that this was really terrible, and as I got older I loved them. I absolutely love them. I had a short show at the ICP, the International Center of Photography in New York, and one of the big hooks for me was that there was an extensive Bellmer show downstairs in the basement exhibition space, and I had the upstairs. It was just heaven for me to see it. Mine is like a super soft version. But mine is … it’s not transgressive, but a more open possibility of being in a body. Obviously both have their own weird sexual connotations. He was really deep in it. This transgressive aspect of being in a body, maybe there is some relationship to Catholicism in that because it’s caught in the body, the dilemmas of being in a body. I don’t know. But I’m crazy about his work. His etchings, his photographs, his coloring, hand-coloring the photographs, setting up props, making sculpture and then using it as an object for photography, or as an object to be acted on in a theatrical way or something. There are just a million interesting ways to think about it. Schwartz: It’s really intriguing to hear you talk about Bellmer. It also makes me think of another artist of that period, André Masson, and of a particular story he tells of being left for dead on the battlefield in World War I with his chest blown open, and no longer being able to tell the difference between where his chest leaves off and the sky begins as he looks up. And then wanting to spend the rest of his life trying to paint that powerful color that he saw when he couldn’t tell the difference any longer between his body and the sky. Smith: Well, I think that’s what George Bataille is talking about too: the pre-ego-conscious space of being not-separate in the world. But also, I studied to be an emergency medical technician, and we had to work in the emergency room and someone had a big knife wound, and I realized that I couldn’t have cared less that my purpose was to stitch him up. All I thought was, “Wow, isn’t that great, the outsides and the insides at the same time!” [Laughter.] So I thought I wasn’t suited for a medical career. Schwartz: Right, right, you’re no longer in the field. No one can call in and try and sue you for enjoying it aesthetically. Smith: I guess because it gave me something to think about. Yes, that space between here and there. Schwartz: That’s really powerful, Kiki. How great to hear your thoughts on Bellmer and Bataille, as well as on Scalapino and the book you’ve just completed. Let me just mention that there are forty-five copies of The Animal Is in the World Like Water in Water. One of those copies exists at the Evergreen State College’s rare books room. Please come by the college and the library to look at it on the premises. 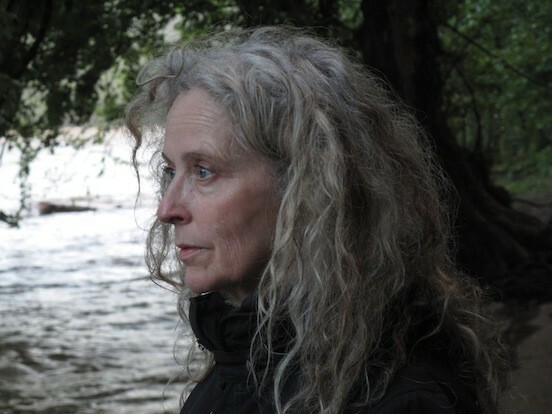 And Kiki Smith, thank you so much for coming to the phone and talking with me. Smith: Thank you. Thank you. It’s my pleasure to talk to you. I also want to say that Leslie was an extraordinary person. For me, it was a great honor to work with her. Schwartz: We all miss her terribly, and it’s great to have this work of hers available to us. © Kiki Smith, courtesy the Pace Gallery.